Xanthan gum is the most versatile elastic thickener and easy-to-use hydrocolloid. It can be used in hot or cold applications, is extremely powerful in small quantities, it provides a rich creamy mouth feel and works synergistically with many other ingredients. It doesn't need to be heated like most starches to be hydrated so it is ideal to make sauces with cold fruits and vegetables. Xanthan gum is very stable with temperature variations, it is effective in alkaline, acid and even salty solutions. Xanthan gum can also withstand freeze / thaw cycles and it is an excellent gluten replacement providing sponginess and firmness. In molecular gastronomy it is widely used for spherification, to suspend solids in liquids thanks to its elasticity, for thickening sauces without altering the mouth feel, for gas retention in liquids, to prevent weeping in gels, help stabilize emulsions and foams. Xanthan gets its name from the bacterium responsible for its production: Xanthomonas campestris. The bacteria consumes sugars and ferments it into a naturally thick, mucus-like substance. That material is then processed into a cream-colored powder. Xanthan gum was first developed in the 1950s at the Northern Regional Research Labs of the USDA. It was produced commercially starting in the mid-1960s and approved for food use in the United States in 1969. The powerful thickener can be derived from a variety of sources. It was originally designed to use up excess lactose sugars that were created as a byproduct of cheese production, but can also be derived from corn, soy, or wheat. The specific strain of bacteria used in fermentation and the processing required vary by source. Today, xanthan is found in a wide variety of foods. 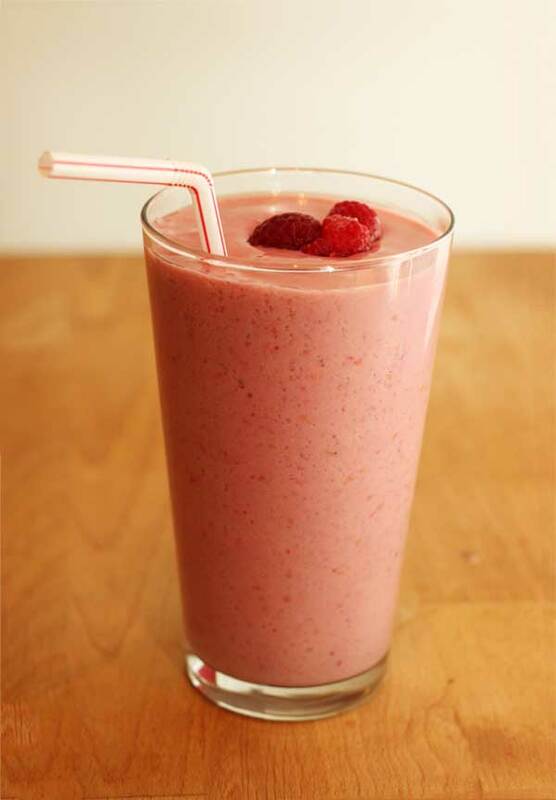 For example, a small quantity of the gum is often added to iced smoothie recipes to give the drinks a creamy texture and to help ice chunks stay dispersed. By itself, xanthan drastically increases the viscosity (thickness) of any liquid it is added to in very low concentrations. In high concentrations, it will form a mucusy paste that looks like a gel but is not technically a gel. It does, however, form a gel when combined with locust bean gum. Xanthan gum's real benefits come through its interactions with other ingredients. By increasing the viscosity of liquids, it helps to prevent syneresis (weeping) in gels, keep ice crystals from forming in frozen goods, and help stabilize emulsions and foams. Xanthan is a popular ingredient in gluten-free foods because it can impart some of the texture that gluten gives to baked goods. We've probably featured xanthan more than any other ingredient on this site. Xanthan Gum has been used by molecular gastronomy Chef Ferran Adria to suspend solids in liquids thanks to its elasticity in his famous "Melon with Ham" dish introduced at elBulli in 2005. This dish consisted of a clear ham consomme with suspended melon caviar spheres. 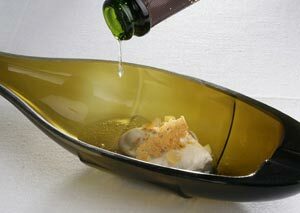 A year later, Joan Roca used Xanthan Gum to retain gas in a cava sauce in his "Oyster with Cava" dish introduced at El Celler de Can Roca in 2006. he modifies cava (Spanish sparkling wine) to create a carbonated cava sauce he calls solid cava. He does this at the winery by introducing Xanthan Gum after the first fermentation of Cava and then let it continue the process for nine months. This results in carbonated cava sauce which he uses in this oyster dish. 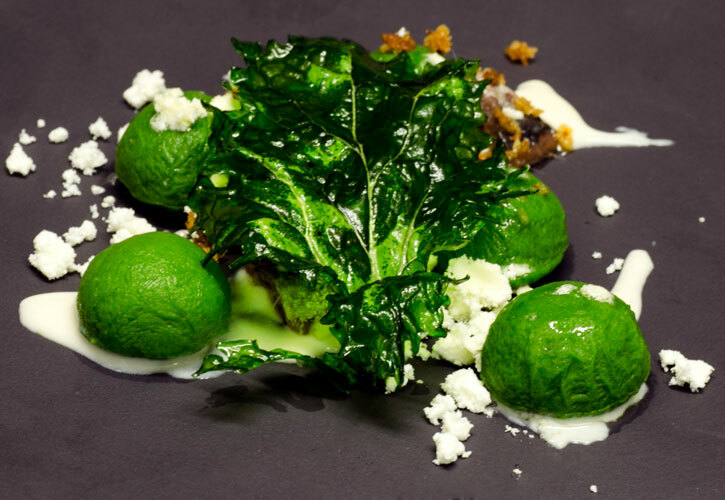 Spherical olives are a classic molecular gastronomy application by chef Ferran Adria and the el Bulli team. It's also one of the early examples of reverse spherification. 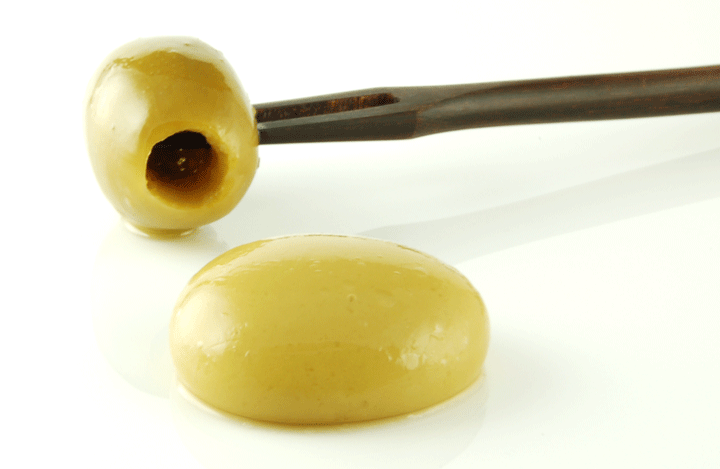 In this application, xanthan gum is used to thicken the olive juice in encased in the spheres. In this recipe for Dumplings, Broccoli Rabe, Garlic Powder, and Anchovies by Chef Cristina Bowerman of Glass Hosteria and Romeo in Rome, xanthan acts as a simple thickener for sauce made with nothing more than garlic and milk. And finally, xanthan plays a stabilizing role in this recipe for Lychee Bubbles Filled with Sage Vapor on Oysters. This is one of our original recipes, based on flavor pairings found through the FoodPairing site. We combine xanthan gum with egg white powder to form long-lasting bubbles. Xanthan Gum is also widely used to elaborate dishes for people with allergies and food intolerance. It is used in low calorie dishes to improve mouth feel and consistency. To make gluten-free flour for those with celiac disease adding sponginess and firmness to the final baked product. Xanthan Gum is also used in diets for people with dysphagia that have difficulty in swallowing. Thanks to the viscocity and elasticity of Xanthan Gum, it is perfect to make creams of fruits, vegetables, meats and fish that are easier to swallow. Temperature : Will hydrate at any temperature. Yes, it's that awesome. Texture: In small quantities, xanthan will add slight body and viscosity to any liquid. Add too much, however, and a xanthan-thickened mixture runs the risk of becoming slimey, with a texture like mucus. For thicker applications such as stews or puddings, we would recommend using a different thickener. In very high concentrations, xanthan-thickened mixtures turn into sticky pastes. Appearance: Clear, though since xanthan stabilizes emulsions, it's very easy to trap air bubbles into a thickened mixture that will never escape, which means that your mixture could become cloudy. Mouthfeel: Rich, creamy, and smooth in small quantities. Mucus-like at higher concentrations. Freeze / Thaw stable: N/A, though xanthan can be used to stabilize frozen applications. Syneresis (weeping): N/A, though xanthan can be used to prevent syneresis in other gelling agents. Shearing: Shear-thinning. That is, xanthan-thickened mixtures become less viscous when exposed to shear, such as blending. However, it will not produce a fluid gel as some shear-thinning gels will. PH Tolerance: Functions at all reasonable pH's (1-13). Other Tolerances: Tolerates alcohol up to 60%, salts, and enzymes. Will not hydrate properly with sugar concentrations greater than 60%. Synergies with other ingredients: Can be used in practically any modernist recipe to increase viscosity, which in turn can stabilize emulsions, strengthen gels, and fortify foams. Xanthan increases thickening power when used with guar gum and carraggeenan and will form a gel with locust bean gum or konjac. Concentration Range: 0.05-0.15% to slightly thicken smoothies, 0.25%-0.5% for thin sauces, up to 0.8% will create a syrupy texture. Higher concentrations may be used in baked goods and for other special applications. Dispersion: Disperses at any temperature. May form clumps if using very cold water, though this will usually resolve itself over time and can be aided with oil, sugar, alcohol, or some mixing. Hydration: Occurs at any temperature. Special uses: many, everything from marshmallows to spherification.